The delicate music of the night. Interestingly enough, from 1985 to 1988, Lightwave was mainly involved inconcert performances and live studio sessions — playing together, learningto build up a coherent electro-acoustic space into which each instrumentistwould bring his own contribution, going deeper and deeper into the secretsof analog synthesis and defining rules and methods for improvising whileplaying. Lightwave used the studio as a training tool for the stage, andplaying in concert simply meant moving all the studio set up on stage inorder to play in a familiar surrounding. There was a permanent emulation between Christoph, Serge and Christian,and they tried to astonish themselves with new sounds, new effects, andunexpected developments during the live sessions. The music was so organicand cohesive that at times one of the musicians would ask: "This sound isreally great, who is playing it?" And the two other guys answered: "It'syou!" Serge usually created some guidelines with sequences. During liveconcerts, Lightwave developed a collaboration with the street-dance companyPopdreams, who created a great technique of slow motion dance and mime.Lightwave also worked with special visual artists to create the right visual atmosphere of the concerts. From the various materials recorded live or during studio sessions,Lightwave compiled several auto-produced cassettes that had a widecirculation in European underground networks. The first one, "ModularExperiment" , was a sort of programmatic statement about the band'sartistic choices, between structure and deconstruction. In 1988, Serge left Lightwave, but remained good friends with Christianand Christoph. It was a difficult step for the band, and a time forquestions, doubts and decisions. Despite his heavy involvement inscientific research and academic life, Christian shared Christoph's will togive Lightwave a new chance, and a new orientation. Losing Serge's creativeinput meant redefining the band's aesthetics as well as its goals. 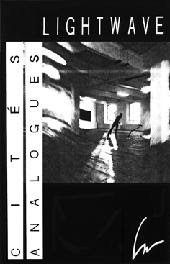 "Cités Analogues" reflects the work of Lightwave as a duo. It was aconcept cassette-album, with a music written and composed and rehearsed forseveral weeks. All its parts were recorded live on a Revox tape machine.There exist several versions of the pieces, and Lightwave chose the bestones for the release. On a very sequenced track, however, Christian — whowas playing a soloist line above Christoph's rythmics and polyphony — madea keyboard mistake. The RSF Modular solo line was great except for a fewseconds. So during the final editing session, Lightwave decided to add thenoise of a train crossing the stereo space. The train just masked the wrongnotes! For the first time, Lightwave built up a whole conceptual project,and worked on the global artistic coherence of an album-length composition.The function and complementarity of the two musicians were firmly definedtoo, and "Cités Analogues" was a first step toward professional productions. Some more time was needed, however, before Lightwave got a first deal witha record company. For a few months, a new musician named Bruno Heuzé joined Lightwave. We met him at the "Ici & Maintenant" radio, where we played veryspecial live performances in 1986 and 1988. Bruno was — andis still — one of the French experts in the field of new musics. He kneweverything from radical free jazz to New York avant-garde. For severalmonths, Christian was a guest programmer in Bruno's radio show, andCalifornian electronic music (such as Steve Roach and Michael Stearns) orEuropean electro-acoustic music got an extensive airplay in the Paris area.Bruno joined Lightwave at a crucial time. Technology was changing: MIDI,sampling, FM synthesis opened new directions. Computers allowed new ways ofcomposing music. Concerts and studio sessions during this period kept arecord of various experimentations with sampling and computer sequencing.Lightwave was always between structure and chaos, between geometry andfreedom. The old analog synthesizers, however, preserved the sonic identityof the band. A trained musician, Bruno was more interested in written composition andin fusion music. And when he left Lightwave, he recorded a great solorecord displaying all his skill. Meanwhile, Lightwave recorded"Nachtmusik" really by mere chance and accident. Lightwave had beenconducting weekly rehearsals at Christoph's place near Paris. And during aweekend in 1989, Bruno was unable to participate. What happened exactly, wedon't know. We probably waited for Bruno for a while, and then we pluggedin all the equipment and had a soundcheck. By the late evening nothing hadreally happened yet, so we took a break and had several drinks. During thenight we entered the studio again, and pushed the "Record" button of theRevox tape machine. There was a blue light in the studio. Without a singleword, we started playing. We had no plans. All the machines were pluged tothe mixing desk and we were moving freely from one to another. We recorded"Nachmusik" live, without any break or overdub. It was a totalimprovisation, but at the same time a structured composition, with anopening movement, a central and a final part. We still played a good partof the night until we felt asleep. Signing with German record company Erdenklang for the release of"Nachtmusik" was a great opportunity. Erdenklang was then one of theleading European record companies in the field of electronic music, and wewere happy to join artists such as Hubert Bognermayr, Harald Zuschrader,Matthias Thurow and Johannes Schmoelling. Serge Leroy helped a lot, and wewent together to Germany. We spent a few days in Berlin, meeting artistssuch as Manuel Göttsching, Alphaville, Chris Franke in his studio,Tangerine Dream, Klaus Schulze, Propeller Island and Conrad Schnizler. FromBerlin, we went to Hamburg, to meet with Ulrich Rützel. We had a dinnertogether and, the day after, a long discussion. At the end of the morning,we got the deal. Ulrich Rützel, Erdenklang's manager, gave Lightwave a chance, and we arestill very grateful to him. "Nachtmusik" is still available and distributedon his catalogue, and sales never stopped. The mixing and mastering sessions of the album were done in Paris. For the "Nachtmusik" piece, the only possible edits were treatments andequalization. A first version was done by french producer Jean-MichelReusser, with heavy use of electronic treatments and effects. The piecesounded as a total aquatic chill-out delirium. The final version, however,was achieved by Michel Geiss, a leading French sound-engineer and musicianwho was a long-time collaborator of Jean-Michel Jarre. We went to aprofessional studio in Paris, and the mixing and treatments were donethrough a SSL mixing desk. Michel enhanced the sound, corrected somefrequences, but did not change the mood and the spirit of our live studioperformances as they were: the most important ingredient was the magic, and it had to be preserved. Michel's artistic and technical choice was theright one. Anyone have 'Ici & maintenant' and 'Modular Experiment' to share? Excellent find. The early tapes of Lightwave are hard to find now. Thank you very much for sharing !!! This album is top notch! Does anyone have any of the other early albums? I'd love to hear more!